Treasures of South Florida Libraries. Monroe County May Hill Russell Library. Monroe County May Hill Russell Library. Key West, Floirda. Local and State History Department. The Monroe County Public Library in Key West as part of its local history collection maintains an extensive collection of works by and about prominent local authors, including Ernest Hemingway and Tennessee Williams. The Library also contains reference files of articles, newspaper clippings, photographs and videotapes. Ernest Hemingway, author, sportsman, and adventurer, is synonymous with Key West, a city he first visited in April 1928. He arrived with his second wife, Pauline Pfeiffer, intending to stay only for a short visit. He soon began work on A Farewell to Arms, and developed a fondness for the area and a group of personal relationships that lasted a lifetime. He thrived on writing during cool morning hours and fishing and carousing with friends during afternoon and evening hours. Though a world traveler, both for work and pleasure, Hemingway crafted much of his work in Key West, where friends and confidantes visited him regularly. During World War II, Hemingway divided his time between Key West and Cuba, where he worked in a semi- official capacity through the United States Embassy in Cuba. He patrolled the seas on his boat, Pilar, searching for German submarines. Following the war, he settled in Cuba with his fourth wife, Mary Welsh. He continued to visit Key West, however, to see his children and check on property. Many of Hemingway's regular haunts, including his home at 907 Whitehead Street, are now part of historic Key West. recitations  3-40  "        "     "      "
This school notebook adds another small piece to the extensive collection of Hemingway manuscripts, letters, and photographs in public and private hands found throughout the world. On September 6, 1913, Ernest Hemingway entered the freshman class of high school in Oak Park, Illinois. He began college preparatory courses that year, with classes in algebra, English, general science, and Latin. Hemingway immediately demonstrated a preference for his English class, buoyed by his great desire to read. His fascination with the great outdoors, including fishing, hunting, hiking, and exploring also marked his early years. In these drawings we are able to see Hemingway's scientific introduction to the world of nature he treasured so much. 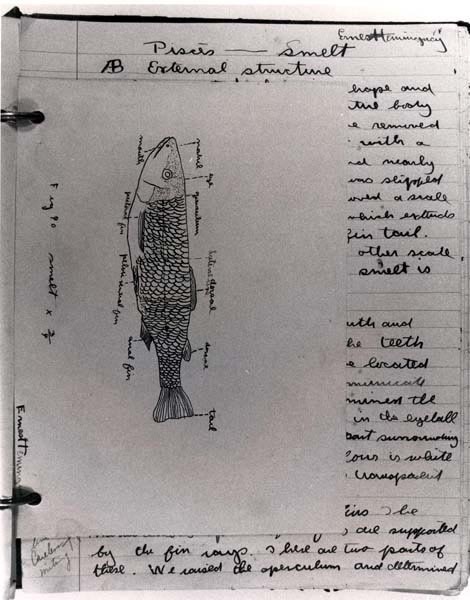 Hemingway placed his name on the pages of this three- ring binder notebook, and he added detailed sketches of animals examined as part of his school work. 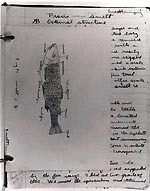 The accompanying text recounts the classroom examination of specimens, including the smelt depicted here in fine detail. Tennessee Williams. Monroe County Public Library Card Application. February 20, 1980. Signed. Monroe County Public Library Card. Overdue notice, Monroe County Public Library to Tennessee Williams for John Keats: The Making of A [sic] Poet. January 20, 1983. Tennessee Williams, one of America's foremost playwrights, was born in Columbus, Mississippi, on March 26, 1911. He first arrived in Key West almost thirty years later, and he produced many of his outstanding works while living in Florida. Fiercely private about his work area, Williams held the only key to the studio where he wrote, preferring to work from dawn until dining on a late breakfast. He developed a lifelong friendship with Ernest Hemingway's second wife, Pauline Pfeiffer. Williams traveled to Cuba and met Hemingway, who wrote him a letter of introduction to Fidel Castro. Like Hemingway, Williams enjoyed the outdoor life, parties, and haunts of Key West. He re-wrote A Streetcar Named Desire while in Key West in 1947, and returned there in 1949, renting a small house he ultimately purchased in 1950. Williams died in New York City on February 23, 1983 and was buried in St. Louis, despite his wish to be buried at sea off Key West. Tennessee Williams had a special fondness for libraries, and his contributions helped to fund the Tennessee Williams Auditorium in the Monroe County Public Library Building in Key West. His library card and an overdue notice for the volume, John Keats: The Making of a Poet, are presented here to acknowledge Tennessee Williams, the great writer of plays and the local citizen and friend of Key West.